After seeing what a hit my Pancake Breakfast Cupcakes were, I wanted to create another twist on the portable pancake idea. 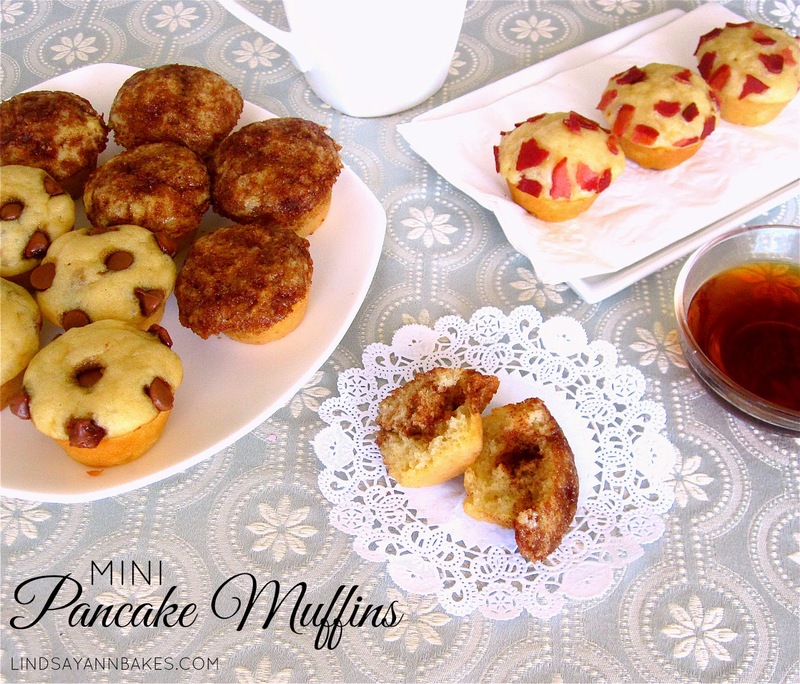 I used the same muffin tin pancake base, but this time, I skipped the frosting and went with fun toppings like maple bacon & cinnamon sugar & chocolate chip... not to mention, they are the perfect size for dunking in a bowl of warm maple syrup! Wrap them up for a grab-and-go morning bite, lunchbox treat, or special occasion breakfast, perfect for sleepovers, birthdays or even a special breakfast in bed! You can customize these with your favorite pancake mix-in. 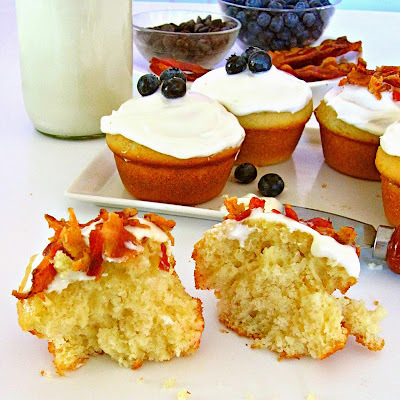 Try anything from blueberries, to sprinkles, chocolate chips or even bacon! Scoop into a mini muffin/cupcake pan. and my favorite, chocolate chips! **May substitute 1/2 cup milk (1%, 2% or whole) mixed with 1 1/2 teaspoons vinegar or lemon juice, let sit a few minutes until it clumps up and thickens, for a buttermilk substitute. Preheat oven to 350 degrees F. Grease or spray a mini muffin pan with non-stick spray. Combine pancake mix, sugar and baking powder in a small bowl. Lightly whisk buttermilk, egg, butter and vanilla in measuring cup. Combine the wet ingredients with the dry mix and gently whisk until just incorporated (it's ok if a few lumps remain). If desired, fold your favorite pancake mix-in into the batter. Pour batter into pan. Bake 8-10 minutes, or until pancake cupcakes are puffy and a toothpick comes out clean. Serve warm with maple syrup for dipping.